The Transit Passenger is a sophisticatedly simple play. 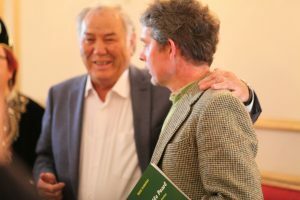 Issabekov has managed to create a play that unfolds around the two main characters, Zeуnep and Aytore in an unlikely intense and short-lived friendship. Zeynep is a mother who is waiting at home for visit from her son, Ertay who instead gets a very unexpected visit from a stranger, Aytore. The writer Issabekov paints a wonderfully realistic picture of mother pacing her apartment, impatiently worrying about why her son might he late, what food she should prepare, what delays could have befallen him and where she may have gone wrong raising him. The play combines the similarities of Zeуnep and Aytore who while strangers both share a love of the apartment where Zeyneр lives and intense love and longing that people feel for an their country and culture, particularly when they have spent time abroad. Both characters share their joys and woes in a way that seems surprise then as well as the reader. It does not seem a stretch to believe that woman would allow a stranger into her home, several times, to share food, memories and the most intimate details of their lives. The play unfolds quite seamlessly with the two main characters cooking, chatting and discovering events that characters have moulded their lives into what they now are. Zeynep and Aytore have both struggled with personal relationships, marriages, tragedies and all the ingredients of a life that has lasted to middle age. This play portrays beautifully the need for people to connect. Clearly showing that it is often easier to talk to and to be completely honest with a stranger, for what do you have lose? Issabekov delicately shows Zeуnep as a mother and woman who is very strong and as a resilient but who is also vulnerable and lonely. Aуtore is also portrayed as a man who is proud and buoyant but who has suffered tremendous loses and has needed to share his thoughts, feelings worries and longings with another person. The play allows this short intense relationship to develop quickly but naturally owing to the talent and understanding Issabekov has of his countrymen and the human condition in general.